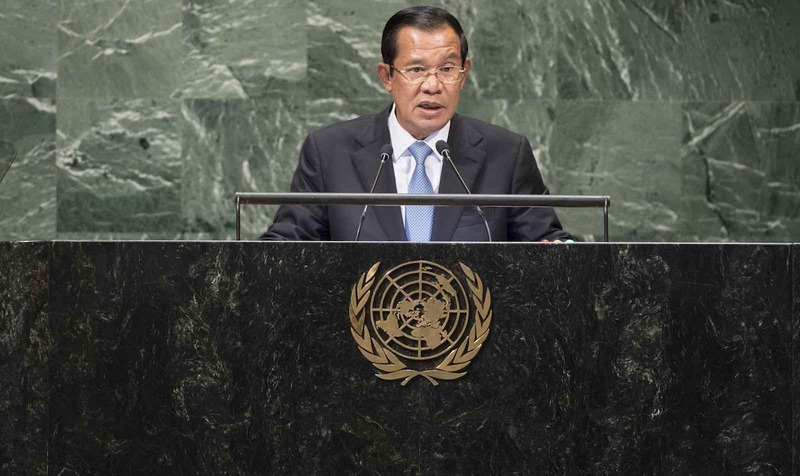 Cambodian Prime Minister Hun Sen last week spoke at the United Nations General Assembly in New York. His presence at this year was highly strategic following the country’s recent general election, which saw his party, the Cambodian People’s Party (CPP) secure its mandate extended for another five years. This is the first time Hun Sen has appeared at the General Assembly in more than a decade. The last time he spoke was in 2005. So why now, after all these years, does the Cambodian prime minister appear at the UN? The UN General Assembly provided the prime minister with the perfect opportunity to set the record straight, as he saw it. As the only credible challenger to the CPP prior to the election, the Cambodian National Rescue Party (CNRP), was dissolved by the Supreme Court, and its leader Kem Sokha imprisoned on charges of treason. Viewed as politically motivated by Western governments, including the United States, Canada, and the European Union, the election was considered to be flawed and unfair. With the CNRP absent from the ballot, the CPP secured an easy victory, winning all 125 parliamentary seats in the National Assembly, against the other 19 political parties that contested the election. When leaders of the former CNRP urged Cambodians to boycott the election, the official turnout of eligible voters was 83%. To the former opposition party, the turnout result seemed too good to be true. Since the election, former CNRP opposition leader Sam Rainsy has sought to sound the alarms internationally, saying the government inflated the voter turnout and intimidated voters. There were rumours circulating that Cambodia could lose its seat at the UN. Moreover, the UN High Commissioner for Human Rights Michelle Bachelet noted the decline in civil and political rights in Cambodia posed an economic and social threat to the country’s development. With only one-party governing the country, the government’s legitimacy came under question. Thus, the opening session of the General Assembly provided the prime minister with the perfect opportunity to set the record straight, as he saw it. Emphasising Cambodia’s success in transitioning from a war-torn country to one that is enjoying peace, stability, and economic growth, Hun Sen sought to present an image that he was not the authoritarian leader as described by his adversaries, rather one that was democratically elected by the Cambodian people. His presence was intended to not only enhance his government’s legitimacy among domestic audiences, dispelling any notion that Cambodia would lose its seat at the UN, but was also meant to illustrate his willingness to confront critics including supporters of the CNRP, the Cambodian diaspora communities, and the international community. Discussing the election, Hun Sen argued Cambodia is a stable liberal democracy – one that upholds and respects the rule of law and holds free, fair, and competitive elections. With nearly seven million Cambodians voting in the election, he emphasised they were able to vote “freely and without any coercion, threat, or violence”. Although Cambodians didn’t have the choice of voting for the CNRP, more than half-a-million Cambodians spoiled their ballots, representing 8.4%. In comparison to 2013, only 1.6% spoiled their ballot. Contentious as the election was, election observers from Malaysia, Russia, Laos, Thailand and Vietnam declared the election to be free, fair and transparent, noting everything was stable and well organised. Without referencing Sam Rainsy or the CNRP directly, he alluded that “some external circles” have encouraged foreign governments to interfere in Cambodia’s domestic affairs through issuing statements undermining the election process and result. According to Hun Sen, “such actions are a serious assault on the will of the Cambodian people”. In a subtle tone, Hun Sen also took the opportunity to rebuke the West under the guise of needing to uphold the UN Charter and a rules-based international order. With sanctions threatened by the US and the EU following the election, Hun Sen noted that “the imposition of unilateral sanction has become a popular weapon of powerful nations in managing their international politics”. Referencing the historical legacies of imperialism and colonialism, he further emphasised that there was a need for both big and small countries to respect one another without “a mission to impose [one’s] civilisation”. if we begin to adhere to the protectionist policy, unilateralism, and trade war, we are closing the door by not welcoming any trade and investment opportunities which have provided prosperity to our countries, both small land big ones, for many decades. Hun Sen’s rebuke of the US, and possibly the EU, was presented ambiguously; however, his remarks come during a time of growing tensions between the US and China, one of Cambodia’s closest allies. This may be viewed as an attempt by the Prime Minister to not only criticise Western governments for their attempt to infringe on Cambodia’s sovereignty and domestic affairs, but also illustrate to China’s President Xi Jinping Cambodia’s support. It is unlikely Hun Sen’s remarks made any difference on the world leaders at the General Assembly; however, it was highly significant for Cambodians to see the prime minister challenge his former political opponent, but also openly criticise the West. His participation was intended to dismiss doubts surrounding the legitimacy of his government at home. The fact is, Hun Sen will continue to lead Cambodia for the next five years, and there’s nothing and no one that will stop him. If he chooses, Trump now has the opportunity to push the Bank towards a more conservative global agenda.